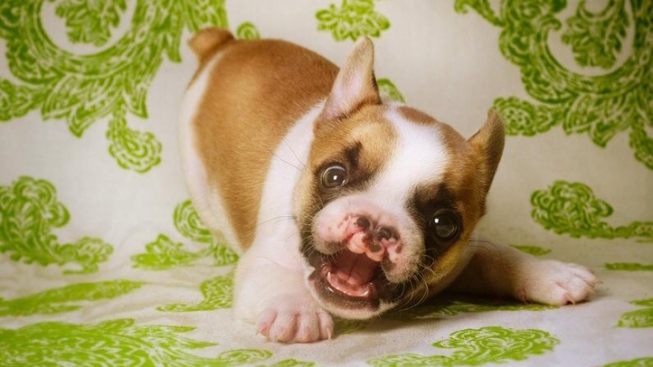 A French bulldog puppy with a cleft palate is tugging on heartstrings across the Internet. Nine-week-old Lentil was born with a deformed nose and lip and a cleft palate and has been under the care of The French Bulldog Rescue Network as well as a foster mother, Lindsay Condefer. Lentil was born on Feb. 2 and has been fed with a feeding tube every three hours, according to the rescue network's website. The condition could put the puppy at risk for lung and nasal inflammation, which makes it difficult to breath, according to experts. Condefer, who lives in Philidelphia, created a blog and Facebook page to show the public his progress and it has garnered nearly 50,000 "Likes." The French Bulldog Rescue Network is currently consulting with veterinary schools for a surgical procedure that could take place a few months from now.